There’s a lot on our stage and screen this week! As we get ready for our Silver Screen Awards Party on Sunday, February 24, we’re bringing back some of the nominated films for another chance to see as they were intended! Nominated for SIX Academy Awards including Best Picture and Best Director, Spike Lee’s BLACKKKLANSMAN screens twice, this Friday at 7 pm and Sunday at 4:30. Nominated for Best Foreign Language Film is Japan’s SHOPLIFTERS, screening at 7:15 pm on Sunday only. + the last chance to catch the smash documentary hit WON’T YOU BE MY NEIGHBOR is Thursday at 7 pm. Saturday, we have two great theatrical performances! Bright Star Children’s Theatre presents Cinderella and Jack and the Beanstalk at 12 pm and is for the little theatre lovers and their families. 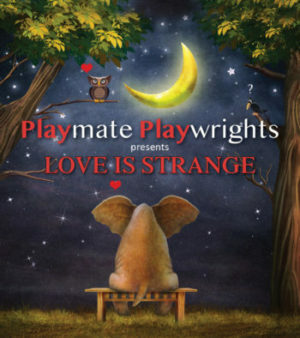 Then at 8 pm, Playmate Playwrights presents LOVE IS STRANGE, a conglomeration of six original one act live play readings in one evening. Playwrights, Jonathan Chiccino, Joanne Eisenberg, Meghan Malloy, Jennifer Nelson and Susan Sandor had the option of taking the theme in any direction they chose, making for a diverse body of work. You may laugh, cry, or sigh in your seats. More info on all of these great programs and more here.